Our excursion begins with a panoramic view of the “Pucllana Pyramid” built in IVth century a.d., and considered as a “sacred village” by the Incas. 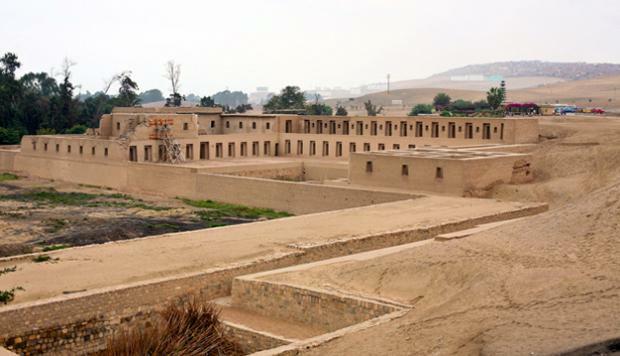 We will then have a guided tour through the splendid and vast archeological site of the Pachacamac Oracle, also known as the temple of the deity. The old Andean civilizations believed Pachacamac was the creator of the universe. The citadel comprises temples, pyramids and palaces, such as the “Temple of the Sun”, the “Temple of Pachacamac”, the “Acllahuasi” or “Palace of the Virgins” of the Sun, amongst others. The whole area was considered holy and part of the mystical axis of the world. Our tour includes a visit to the bohemian district of Barranco, where we will see the “Puente de los Suspiros”,we will continue towards “El salto del Fraile”, the Swamps of Villa and delight in some spectacular sights of the Pacific Ocean.